Never Give Up: Happy Saint John's Day! "There was a man sent from God, whose name was John. He came as a witness to testify to the light, so that all might believe through him. He himself was not the light, but he came to testify to the light. The true light, which enlightens everyone, was coming into the world"
by the forgiveness of their sins" (Luke 1:76-77). Picture above: 15th Century Birth and Naming of the Baptist by Giovanni da Fiesole (a.k.a. 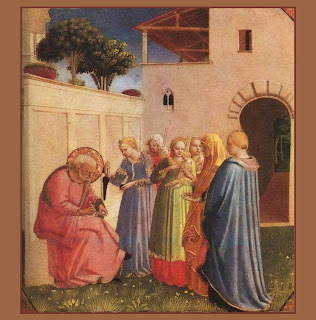 "Fra Angelico").